Sandler, Martin W. Lincoln through the Lens: How Photography Revealed and Shaped an Extraordinary Life. New York: Walker & Company, 2009. Martin uniquely begins each page of text with a quote from Lincoln. The page next to it is a picture about the text. There are also smaller images on the page with captions at the bottom of the page of text. The two pages are like a chapter about Lincoln's life and times. They are arranged chronologically. The majority of pictures were taken by Matthew Brady. 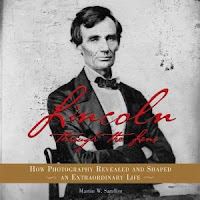 It was said that Brady's photograph won Lincoln the presidency. The book is part biography and part history of the Civil War. It includes over 100 photographs, drawings, paintings and cartoons. The photos depict Lincoln's career, battlefields, his family and important men in history like Stephen A. Douglas, Robert E. Lee, Ulysses S. Grant and John Wilkes Booth. The reading level is appropriate for fifth graders or above. Each small chapter give the reader insight into Lincoln and the Civil War. It is filled with interesting facts. It is said that one little girl wrote to Lincoln and told him his face was too thin and he needed to grow whiskers. He was never seen photographed without a beard again. The text and photos are organized chronologically with quotes at the top of the page and captions at the bottom of the page explaining where the photographs were taken. There is an index at the end of the book too. The information is accurate and there is evidence in photographs. The sources of all of the quotations are included at the end of the book. Also included at the end of the book are a list of sources, and books and web sites for further reading. There is also a list of places to visit in the country that are reminders of Lincoln. The photographs are the critical part of this book. They are laid out alongside the text on the next page. The photos are generally clear and the content from the visuals is easily understood with he captions. The photographs from war are graphic to show the evil of war. Booklist talked about the photos being "the wow factor". The "wow factor" to me was how many children fought in the Civil War. Photos of ten year old children were heartbreaking! I as the reader learned so much about Lincoln the man, president and husband. I also learned so much about that time in history through a "slim book that speaks volumes"- Booklist. The photographs and the writing in this book were its strengths. I found no weaknesses.